A group of 600 artists, music historians and members of the industry will choose 2013's inductees. They will be honored April 18 in Los Angeles. 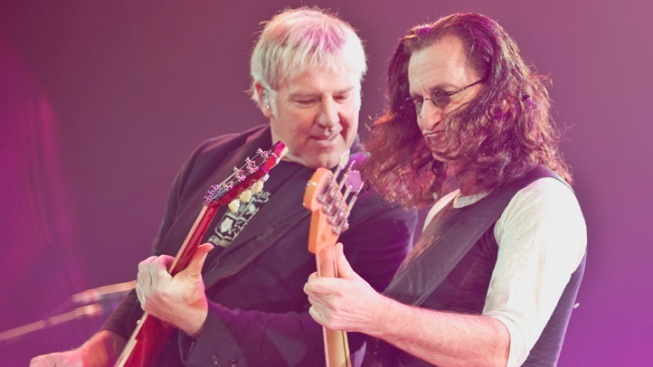 Alex Lifeson and Geddy Lee of Rush perform on stage at Motorpoint Arena in Sheffield, UK. Rush is a first-time nominee for the Rock and Roll Hall of Fame. Rush, Deep Purple, Public Enemy and N.W.A. are among the group of first-time nominees for the Rock and Roll Hall of Fame. They join returnees Heart, Joan Jett and the Blackhearts, Randy Newman, Donna Summer and Kraftwerk among the 15 artists vying for entry. Even in the iPod age, the list of nominees up for induction in 2013 is as eclectic as they come. Nominees differ wildly in sound, origin and influence, ranging from the enduring prog rock of Canadian trio Rush and Procul Harum to German proto-electronica act Kraftwerk, the disco of Chic and Summer to the New Orleans funk of The Meters and the blues of Albert King and the Paul Butterfield Blues Band. Motown also is represented by first-ballot entries The Mavelettes. Joel Peresman, President and CEO of the Rock and Roll Hall of Fame Foundation, acknowledged the extreme variety of this year's nominee class in a Thursday news release. "The definition of 'rock and roll' means different things to different people, but as broad as the classifications may be, they all share a common love of the music," Peresman said. "This year we again proudly put forth a fantastic array of groups and artists that span the entire genre that is 'rock and roll.'" It's the sixth time on the ballot for Summer, but the first since her death in May at age 63. Chic is on the ballot for the seventh time since 2003.